Throat - White Marabou, to bend of hook. Topping - 4 or 5 peacock herls as long as wing. Body - Natural seal's fur ribbed with narrow oval gold tinsel. Thorax - First build up some padding material such as cotton or wool yarn. If the nymph is weighted, lead electric fuse wire is used as a foundation. This is wrapped over a base of lacquered tying silk (thread) while still wet, and gone over again with tying silk (thread) after it is wound on. This extra procedure is to keep the wire base from twisting on the hook. 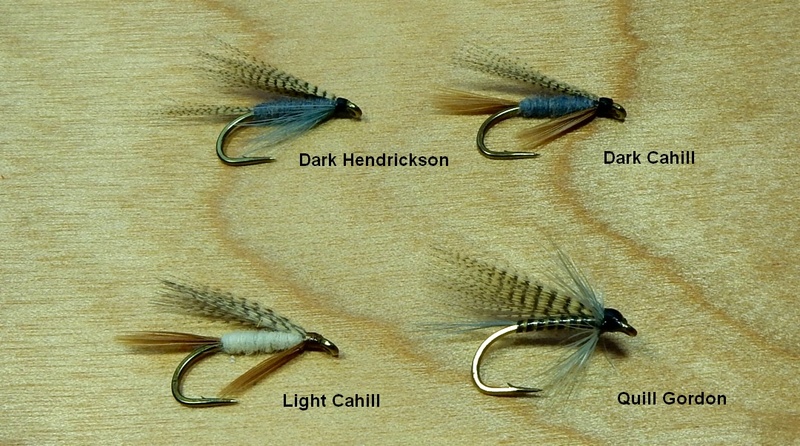 In the case of of a weighted nymph, the fly can be reversed in the vise, and the wing cases put on what would ordinarily be the belly or the bottom of the nymph, as with a weighted fly, the hook will almost invariably turn point up in the water. Hackle - European partridge, the more grayish feather. Wing Case - Bright blue feather from the wing of an English kingfisher, lacquered when in place. This feather, although exactly what I needed to suggest the sparkle of color or light on the wing case, is apt to come apart after some use. I have tried to find a proper substitute and so far the best is a bit of synthetic silk floss, of nearly the same color, heavily lacquered after tying in. It is permanent but not as bright and sparkling as the feather. My good friend, Harry Darbee, the fly tier, recently suggested that the stripped quill from a large feather such as goose or swan could be dyes and used for this purpose. It should be much more nearly permanent than the rather delicate kingfisher feather, but as yet I have not had the opportunity of trying it out. Hackle - European partridge, either the gray or brown speckled hackle feather. Tail - A few strands of dark cochy-bondhu or dary furnace hackle barbules. Body - Muskrat or mole fur mixed with red-brown dyed seal (same as both wet and dry fly bodies in other groups), ribbed with narrow oval gold tinsel, These nymph bodies should be rather loosely spun and tied rough, and the dubbing picked out between the ribs. Hackle - Dark furnace or cochy-bondhu hackle. iIn all these nymphs the hackle is clipped off top and bottom and jusy left at the sides.